Washington Riders Alert: The government wants more of your money and here's how they're going to get it. As a newcomer to Washington State who is a motorcyclist and a writer, some might say that I do not have enough "time in grade” as a resident of the state to comment on the latest state park levied fee, the "Discover Pass”, but there are a few observations I can certainly make. Reminder here: The Boston Tea Party was all about dual taxation. Maybe we're going to need an Olympia Tea Party? If I simply want to ride my motorcycle through a state park and stop to take in the natural beauty (or maybe a pee), I guess as a street bike rider I would need a Discover Pass as well. I am not a fisherman, a hunter, a camping buff, or an off-road motorcycle rider. While I admit that I probably will not be as heavily impacted by the Discover Pass fee as some, there are ways that the new requirement will likely change my behavior about when and where I ride. For example, I am much less likely to stop at the state parks along Washington’s beautiful roads and scenic highways because I don’t know whether or not I will be asked to pay $10 on the way in, $30 for a decal (that I am not going to stick on my bike) or be fined $99 because I stopped to visit a state park. I don’t want the hassle, and will simply pass on the Discover Pass. Any restaurants or privately owned businesses featured in or near a state park are probably going to lose my business as well. I’ll ride the beautiful scenic roads and highways, pay my road use taxes when I fill up my tank and renew my tag, and eat at Burger King. I also understand that a person who pays for some types of licenses or park fees is supposed to be exempt from other fees and license costs, and this includes the Discover Pass. But as an outsider looking in, all I can say is that understanding the myriad of state agencies (with accompanying acronyms) that supervise park or public lands - let’s see, there’s the Washington Department of Fish and Wildlife (the WDFW), the Department of Natural Resources (the DNR), and the State Parks Department (are there more?) and trying to figure out rules and regulations here is simply bewildering. • When you buy a hunting and/or fishing license, you will receive a vehicle access pass for WDFW-managed lands and won’t need the Discover Pass. You will still need the Discover Pass to hunt or fish on DNR or State Parks land. Stop right there! So if you have a fishing license and you’re fishing just inside "WDFW-managed lands” you’re okay, but if they happen to be jumping a bit better a little further down the creek or river, and that is on State Parks land ... cha-ching! Does that mean you have to buy a pass or pay a fine? • Disabled veterans and other State Parks pass holders: Qualified disabled veterans and other qualified State Parks pass holders registered through State Parks do not need to purchase a Discover Pass for access to Washington state parks. 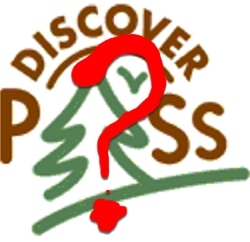 They will need to purchase the Discover Pass for access to lands managed by WDFW and DNR. If you’re a disable veteran, you don’t need a Discover Pass to go to a state park, but you do need one for "access to lands managed by the WDFW and DNR”. Isn’t it considerate that Washington State is so thankful to disabled veterans that they will give them a pass to go into one of these three areas "for free”? Veterans will need to bring their maps though, because if you make a mistake and park your vehicle on the "wrong kind of land”... cha-ching! • You will not need a Discover Pass to launch your boat from a State Parks boat launch if you have the Natural Investment Permit. You will need the Discover Pass for boat launches managed by DNR and WDFW. Boat owners? You’ve paid for registration and tags for your hauling vehicle and trailer, you’ve paid $70 for your "Natural Investment Permit” and while the state government does not feel it necessary to burden you further with the additional requirement of a Discover Pass at state parks, if you launch your boat from another spot that just happens to be on either WDFW or DNR lands... cha-ching! I ride a street legal dual sport motorcycle. According to state law I have to have it plated in order to operate it on public roads. I also have to have an Off Road Vehicle (ORV) tab in order to operate it off road. Now I will have to have a Discover Pass in order to operate it in state parks, WDFW and DNR lands. According to the WDFW, a WDFW hunting license or fishing license will get you on to WDFW lands without having to purchase a Discover Pass. According to the State Parks Department a receipt for a campground at a state park will get you onto state parks land without having to purchase a Discover Pass. So please tell me why my ORV tab is not treated the same way? I guess if it’s stolen, it’s tough luck. "But Democrats said budget cuts would close lands to public access and cut down on maintenance and law enforcement at those that remain open, unless the new fee is approved to cover the gap. "It fills the (budget) hole by having people who utilize the parks pay for the parks," said Rep. Zack Hudgins, D-Tukwila. At $2.50 per month for use of 119 parks and the 6.5 million acres of land managed by the other agencies, Rep. Chris Hurst, D-Enumclaw, called the fee "an extraordinary bargain." I have news for Representative Hudgins; the public already pays for the parks. Representative Hurst calls the new fee an "extraordinary bargain”. I wonder if he asked his constituents what they thought? My guess is no. Here’s a quote from state senator Kevin Ranker's log (http://blog.senatedemocrats.wa.gov/ranker/). "The viability of Washington’s state parks, which are struggling to meet growing demand at a time when state funds are being steadily slashed, might be rescued by a proposal to create an annual, universal pass that lets the public visit lands managed by the state Parks and Recreation Commission, or the state departments of Natural Resources and Fish and Wildlife." I guess what bothers me about news reports and quotes like Senator Ranker’s is the "end of the world as you know it” couching of the discussion that always tries to convince you that the only solution to the increasing costs of state functions is to raise taxes and fees, not cut their expenses, and the idea that three state government agencies with responsibilities that overlap may be wasting taxpayer money is never examined. In addition, why those in government always give new fees a "happy name” like "Discover Pass” that tries to get around calling it what it is - another increase in your tax burden, regardless of if it’s really needed or not. Where's Tim Eyman when we need him? For the record, I am not against the setting up of reasonable state bureaucracies and tax structure to cover the cost of maintaining public lands, but why isn’t removing the redundancy and waste of having - just for example - three state agencies that manage public lands, ever seriously acted upon? It is just as likely that eliminating redundancy of the three state agencies that manage Washington State lands would go a long way toward solving land use budget shortfalls, if you could get an honest independent audit of the agencies involved. But that would require a sea change or a paradigm shift in thinking, and I expect that this will not happen. That’s the first thing to do before the state considers adding another tax to an already burdened state population, not a new user fee called the Discover Pass. Philip Buonpastore has written for numerous national motorcycle print publications. His new book, Shifting Gears: A Guide to Motorcycle Riding for the Over-Forty Set hits stores later this year.